Non-surgical age-defying treatments such as Botox and Dysport, and injectable wrinkle-fillers such as Restylane or Juvederm are experiencing a surge of popularity in Canada. Here are the 12 most common questions answered about Botox Cosmetic and Dysport that you should know before you take the plunge. What exactly IS Botox Cosmetic or Dysport? A Botox or Dysport treatment involves a very small amount of a natural purified protein, injected just below the skin’s surface with a very fine needle above specific small muscles of the face. It temporarily relaxes those muscles that cause wrinkles, creating a smoother, refreshed and improved appearance. Botox and Dysport are most commonly used to erase frown lines between the eyebrows, eliminate forehead furrows and wrinkles, soften crow’s feet around the eyes, minimize frown lines at the corners of the mouth, and decrease age lines and wrinkles in the neck. Other uses include TMD (grinding and jaw pain) treatment, tension-type headache and migraine pain treatment, Bells Palsy treatment, and even hyperhidrosis (excessive sweating). Do injectables such as Botox make wrinkles vanish? Yes and no. They relax specific facial muscles that help create specific wrinkles and furrows in the skin of our face. So, while Botox is in effect, specific muscles (for example, those muscles that cause angry-looking frown lines between your eyebrows) are relaxed – preventing them from deepening those annoying or unsightly wrinkles. Over time, repeated treatments result in smoothening of those wrinkles and skin folds. What will my face look like afterward? Over the next few days after treatment, there will be a change in certain expressions, minimizing wrinkles. You will look more awake, more energized and youthful, and less tired and cranky – and only your doctor and you will know why. Is it true that I won’t be able to express myself with my face? I don’t want Botox to make me look “frozen”. No. Some people heard rumors that their face will be “frozen” without expressions – this is a MYTH. Only the facial expressions that are associated with the wrinkles and lines that you don’t want will be relaxed. So, for example, you will still be able to smile, laugh, wink, and do many other expressions you normally do, but if you wanted your scowl/frown lines between your eyebrows to “disappear” for awhile, then the muscles above your eyebrows that cause those scowl lines will be relaxed. Is Botox or Dysport safe? Yes. It is the most conservative, highly-effective wrinkle-reducing rejuvenation treatment available, and far safer than plastic surgery. Injectables, such as Botox, have been thoroughly researched (more than 3000 studies), clinically used for over 20 years, and are approved by the Health Protection Branch of Canada and the FDA. More than 17 million procedures have been performed since 2002. They are natural purified proteins that are extracted from bacteria and refined into a medicine (similar to how penicillin protein is made and utilized as a medicine). It only takes a few days to start seeing results, and the effects gradually wear off naturally after 3-4 months. Treatment is then repeated, to maintain the effect. For those people who regularly get treatments for a few years, their “wrinkle muscles” become easier to relax, and then often last up to 6 months at a time. What should I expect at a Botox or Dysport treatment appointment? Usually, you will first have a free initial consultation with a health care professional, which may take 30-60 minutes. They will review your health history and areas of concern, and sometimes take a series of face photos. They will then discuss the amount of Botox or Dysport needed to treat your specific areas of concern and the result you can expect. The injection treatment visits are simple and quick, taking only 15-20 minutes, so they can be done on a lunch hour. Does the injection needle hurt? No. With a highly-skilled dentist or physician, and the right technique, the sensation is usually no more than a little pinch. It is administered via a few tiny injections with a very tiny pain-free needle, barely under the skin. The same kind of needle that diabetics use. In most places in North American, the fee for Botox or Dysport varies from $10-$12 per unit if injected by advanced-trained medical professionals, or $12-$15 per unit if injected by a dermatologist or cosmetic surgeon. Your forehead could require about 12 – 18 units; frown lines may need 25 – 45 units and crow’s feet may need 6 – 15 units per eye (men often need almost double that amount, due to stronger facial muscles and deeper wrinkles). What are the benefits of Botox treatment? It delivers dramatic, natural-looking results with NO DOWN TIME. There is no direct effect on sensory nerves, so you’ll still have normal feeling in the injected areas. The discomfort is minimal, feeling like a little pinch or bug bite. No sedation or local anesthetic is required. Possible side effects are very rare and not permanent. They include slight tenderness at the injection sites, small temporary bruising, and short-term headache. If any adverse events occur, it will be in the first week and will usually resolve in 7-10 days. 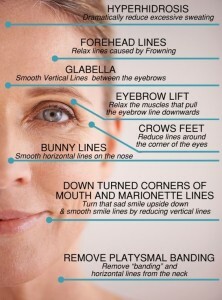 Learn more about our special Botox offers and be sure to ask for a free consultation!